This week we're paying homage to our heroes with lettering artist Becca Clason. Welcome to Week 7 of #HOMwork! This week we have the pleasure of learning from another talented guest teacher: Becca Clason! If you’re not familiar with Becca’s work, you’re in for a treat (literally, because she specializes in food lettering). 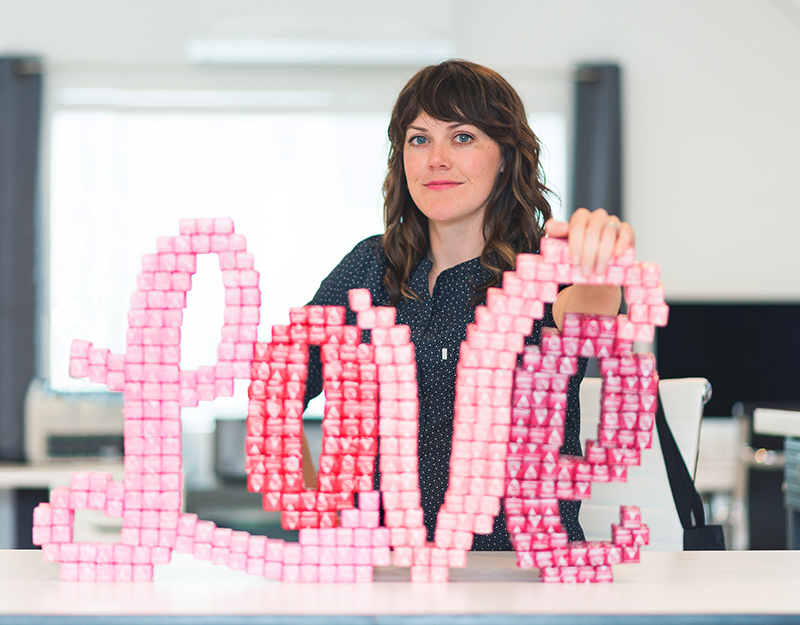 She and her husband, Josh, run a stop-motion & live-action lettering studio right outside of Salt Lake City, Utah. Becca has created work for clients like Starbucks, American Express and Target, and she also founded Letter West, an annual lettering retreat (psst...tickets go on sale very soon!). Make sure to peep and follow her Instagram feed for a multitude of fun personal projects too. My mom graduated from university with a Bachelor of Fine Arts in illustration. Many parents don't think their kids can make a living as an artist, but as an artist herself, my mom was only ever encouraging about my pursuit of advertising and graphic design. After college, my mom had a couple different jobs like silkscreening T-shirts and illustrating at an advertising agency & for magazines before she had her first child. She took some time off to be a full-time mom, and she seemed to often have creative hobbies and pursuits on the side. After she had her final kid, she started freelancing—making clip art books, rubber stamp designs, and scrapbook paper designs. Then (here comes an important milestone!) she started her own company when I was 13 years old and my youngest sibling was almost three. She created her first line of scrapbooking products from a card table in our kitchen. She packed and shipped orders out of our garage, then she rented a small one-room office, but then expanded to a few rooms, and then expanded again to bigger office with a warehouse. Over the course of seven years, she grew her wholesale scrapbooking business to 35 employees and hundreds of products. She frequented trade shows and was invited to teach workshops around the world. She worked so hard during these years, with little sleep and little social life. She sold the company when I was 21 years old and retired early at the age of 51. These accomplishments are all amazing, but what's most amazing to me about my mom's story is that she and my dad got a divorce a year after she started her company, and yet she alone financially supported her six children during these years and made time for us kids to teach us, support us, and take us to church every Sunday. I saw her work so hard, night and day, to support her family doing something she loved, and this had an indelible impact on me. She never gave up on trying to achieve what she'd set out to do (she also never raised her voice at me, even though I was not an easy teenager to live with, which speaks to her kindness and patience). Thanks to my hero's actions more than her words, as a teenage girl growing up in a single-parent home, I knew I could become a strong woman with dreams that could come true, that I had it in me to pursue a creative career, and that someday I'd be able to build something of my own and start my own business. It will teach you more about yourself. Sort of like therapy or journaling, this project will help bring to the surface and articulate some of the feelings, aspirations, and dreams you've felt but haven't put into words. The finished piece will serve as a good reminder for you to keep aiming high and becoming your best self. After you finish drawing your hero + your reasons why you look up to them,snap a photo of your final piece and post it on Instagram with the hashtag #HOMwork so we can see what everyone created. In the caption of the post, tell us more about your hero and what impact they've had on your life. We can't wait to be inspired by the stories you share with us this week. Even Oprah has a hero! Now it's your turn. PS Make sure to use the hashtag #HOMwork and tag both @homsweethom and @beccaclason in your post on Instagram. We’ll both be featuring our favorite pieces in our Story this week, so make sure to post yours before the next challenge goes out.